One of the very best reasons to get a massage is for relaxation. Relaxation massage helps to support your body, including blood circulation and flexibility of joints. Regular massage can help prevent pain, muscle tension, and stress points from building up and causing problems. Why wait until you have a problem to get a massage? Massage is perfect for preventing issues with your tissues. Relaxation massage is usually recommended at least once per month, or as often as you want! There may be times in your life where you experience higher levels of stress and more muscle tension than normal. It is especially important to practice good self-care during these times. When we “don’t have time” for a massage, is usually when we need one the most. Make yourself a priority even during stressful times, your health is worth it. If you are in a high-stress job or you work in an environment where you stay in a certain position for a long period of time (at a computer for example), you may begin to develop tight or “knotted” muscles. This will frequently occur in your shoulders, arms, and back. All of this increased muscle tension will make movement harder and can cause a great deal of pain. Regular massage can help to keep you loosened up and will help to prevent pain and stiffness. Living with high levels of stress for a prolonged amount of time increases the risk of contracting heart disease and other diseases. It has been estimated that 75 – 90 percent of all visits to primary care physicians are for stress related problems. The good news is, massage can help! Just knowing your massage is coming up in a few days can help to relieve stress, and a massage every 2-4 weeks will help with stress related tension. Are you a weekend warrior, or do you just like to stay in shape? Either way, massage can help with sports performance and recovery. Many athletes and physically active people receive sports massage because it enhances their performance, prevents injury, and speeds up their muscles’ recovery. Competitive sports can put a lot of stress on a person’s muscles! Research conducted at the Buck Institute for Research on Aging at McMaster University in Ontario shows that massage reduces inflammation and stimulates the growth of new mitochondria, the energy-producing units in the cells, after strenuous exercise. This means that massage can help relieve pain, build muscles and help with muscle recovery too! For these benefits it is recommended that you get a massage up to three times a week or at least three times a month. Chronic Health Conditions People with ongoing health issues often find massage very helpful to alleviate symptoms. Chronic health problems that greatly benefit from massage therapy include back pain, joint pain, and localized inflammation. If you get therapy for specific issues, the frequency of getting massage therapy varies with the type of condition you have and how severe it is. Relief from pain can usually be achieved with 2-4 massage sessions per month. Your massage therapist will work with you to help you get on the best schedule for your body. Pregnant women can greatly benefit from massage therapy! Prenatal massage and is popular among expectant mothers, who often experience a lot of aches and pains as their pregnancy progresses. Many women suffer from back pain, hip & sciatic pain, headaches, and tired legs & feet. But you don’t have to, a certified massage therapist can help to relieve those discomforts. Going to your massage therapist once or twice a month can help with the symptoms caused by pregnancy, and it can even help you sleep better. Of course, it’s always a good idea to check with your doctor and your massage therapist to ensure that you don’t have any pregnancy related conditions that would contraindicate massage therapy for you. Most women experiencing a healthy pregnancy can and should enjoy regular massage sessions. We find that there is a sweet spot for most of our clients. When you first begin getting massage it is most advantageous to come in frequently one to three times per week. Then after a week or two go down to one time per week then skip weeks in between. You will know the proper frequency for your body to feel it’s best when you go to long and you feel the aches and pains or stiffness return. Then you go down to slightly sooner than you had gone between massage appointments. The most common frequency that helps many clients with performance and pain management is every other week. 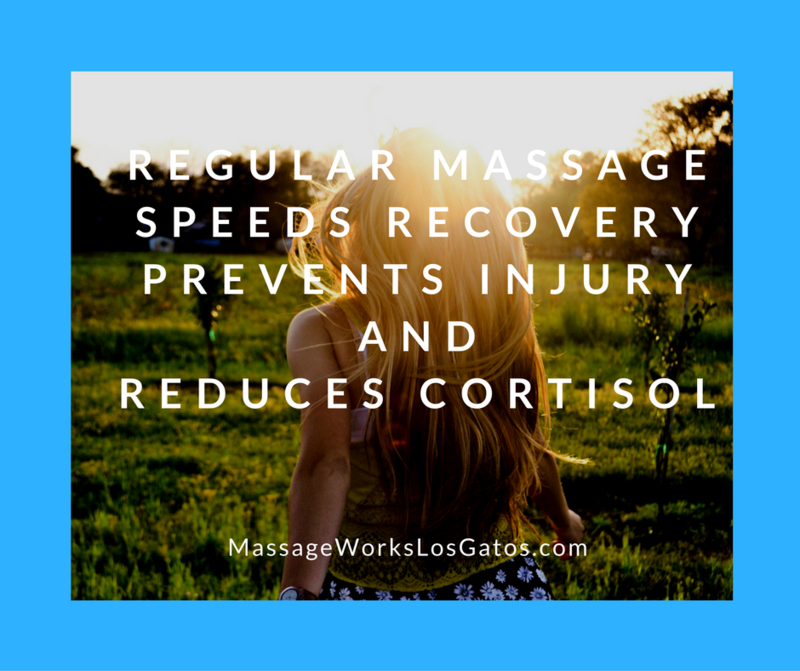 Massage Works Los Gatos offers massage therapy that does just that, it works, to help you get relief from chronic or acute pain and function at the top of your game. Our mission is to customize effective massage therapy treatments unique to your needs that help you get relief from pain and stress. Located in downtown Los Gatos for over 10 years we specialize in therapeutic, sports and clinical massage therapy.